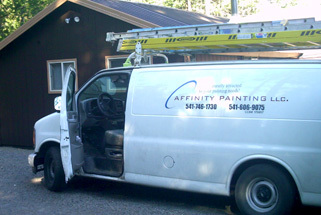 Affinity Painting LLC is a premier residential and commercial painting contractor Eugene Oregon. The owner, Ed has been painting homes and businesses since 1985 and in 2007 decided to start his own painting company. The success of Affinity Painting has been solely derived from satisfied customers and referrals. We take pride in the quality of work and customer service that we give to our new and returning clients. This attitude towards customer satisfaction is so important to the success of our business, because our current customers not only become repeat customers, but will recommend our work when the opportunity arises. We have learned that individuals understand that they want something painted, but are often overwhelmed by the array of choices and products, that their paint job never becomes a reality. Most often most individuals do not understand the differences in paint products, textures and all of the steps that are needed to make sure that your paint job is going to last for many years to come. Affinity Painting will educate you on the type of paint that is needed for your painting job. The type and quality of paint is very important when it for the outcome to end in a successful painting service. Our professional and skilled painters are passionate when it comes to their work. They enjoy painting and it shows through in the quality of service that is provided to our customers. We pride ourselves on staying up-to-date on the latest painting techniques and products available today. When you are looking for quality, as well as beauty, then Affinity Painting is your painting contractor Eugene Oregon that you will want to work with. From the start of the painting job, to the very end, we will get your painting job done quickly, professionally and efficiently. Free estimates are available, so contact us today so that we can turn your painting desires into a reality.